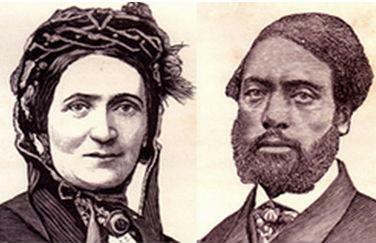 Ellen Craft Escaped Enslavement by Disguising as a White Man! OK while editing an article about African American Literature which mentioned the book, Running a Thousand Miles for Freedom by William Craft and Ellen Craft. The book tells the story of William Craft (1824 – 1900) and Ellen Craft (1826 – 1891) who were slaves from Macon, Georgia and escaped to the North in December 1848 by traveling openly by train and steamboat, arriving in Philadelphia on Christmas Day. She passed as a white male planter and he as her personal servant. [WTF?!] Their daring escape was widely publicized, making them among the most famous of fugitive slaves. Abolitionists featured them in public lectures to gain support in the struggle to end the institution. White people are so crazy! I have to admit I was unfamiliar with this particular story, but I know white folks regularly enslaved their own children. However, it still strikes me as so bizarre that people, white enough to pass for "white," would still be enslaved.